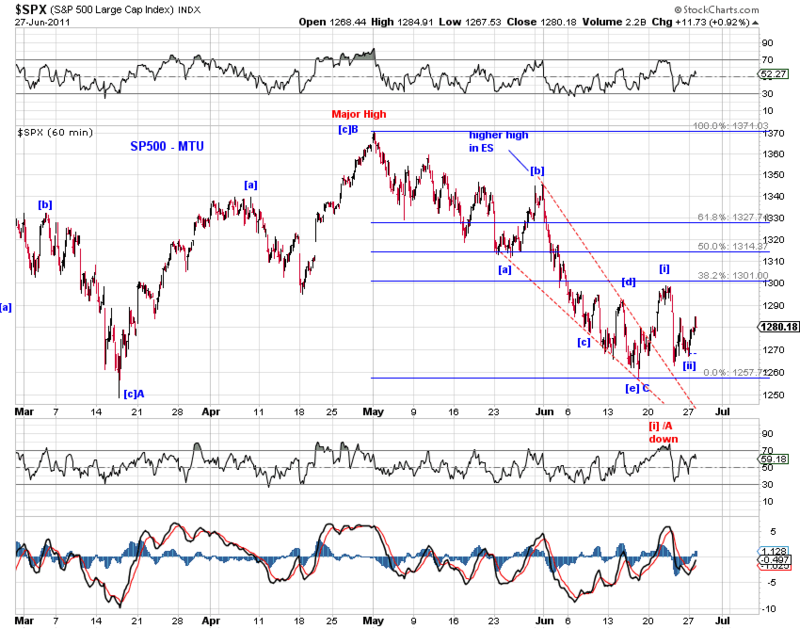 see the 2nd chart below, gunning for 0.618 retrace. 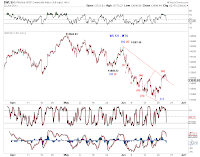 Current assessment - Cash indexes are finishing up the first three from the nominal low or the first impulse from the orthodox low (Chart 1 on WLSH). 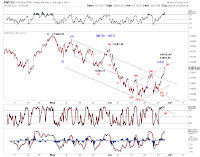 It's getting increasingly unlikely that the rebound is part of the recent decline (i.e. wave [iv]-up). 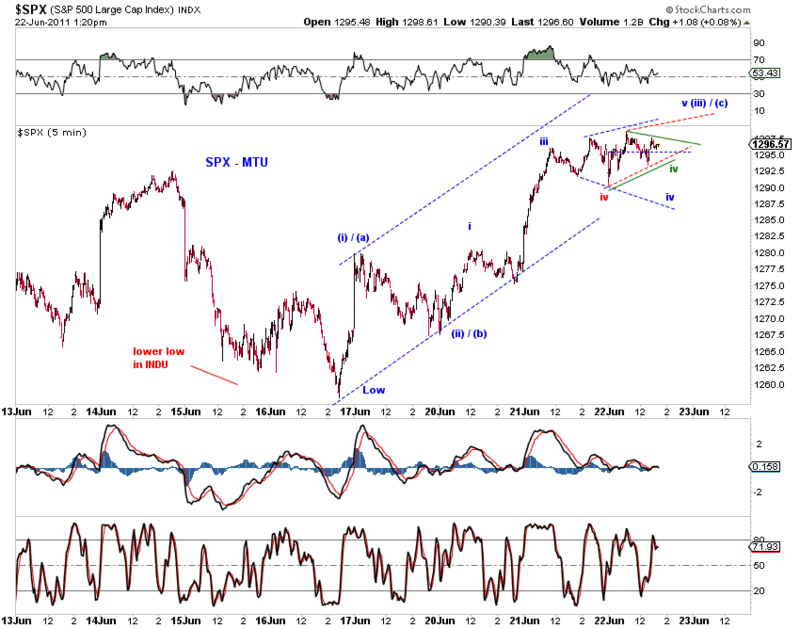 ES is likely tracing out an expanded flat (or triangle, less likely) small-degree 4th wave (Chart 2). 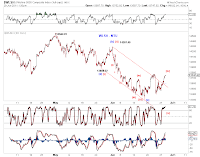 Also see yesterday's EOD update for discussions on the larger count. Overlap in WLSH this AM. 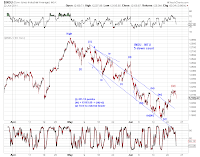 Odds favor this rebound being (i) or [a], see yesterday's EOD update for details. 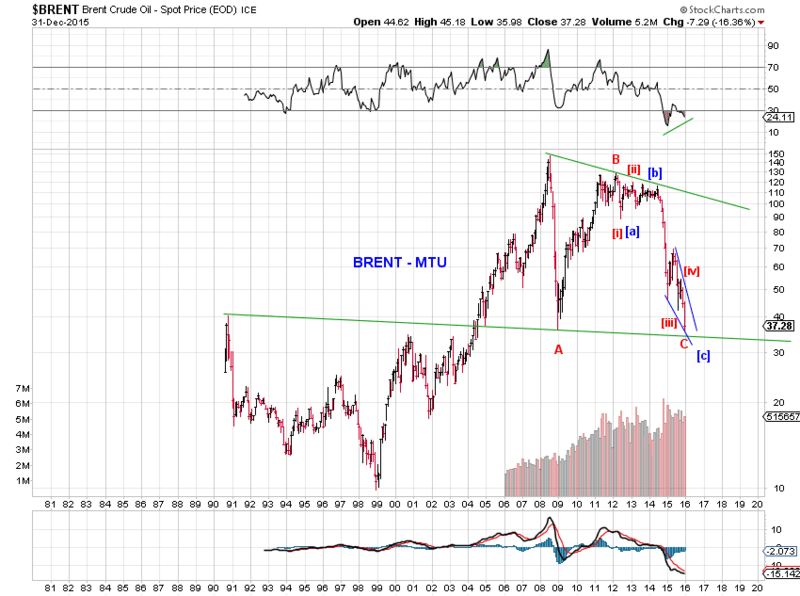 There are three near term options (Chart 1). 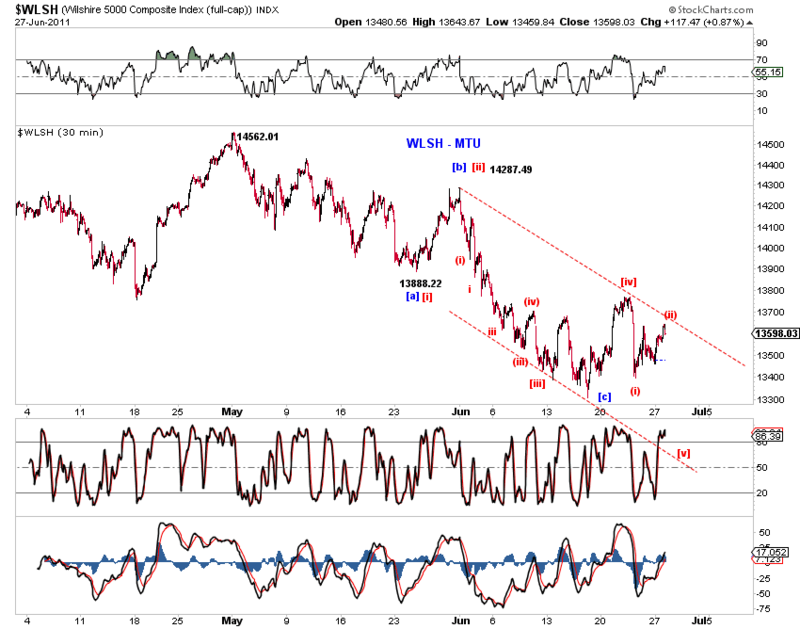 [1-bullish, similar likelihood to 2-semi bullish below] The next phase of advance has started - the blue (i)-up as marked. 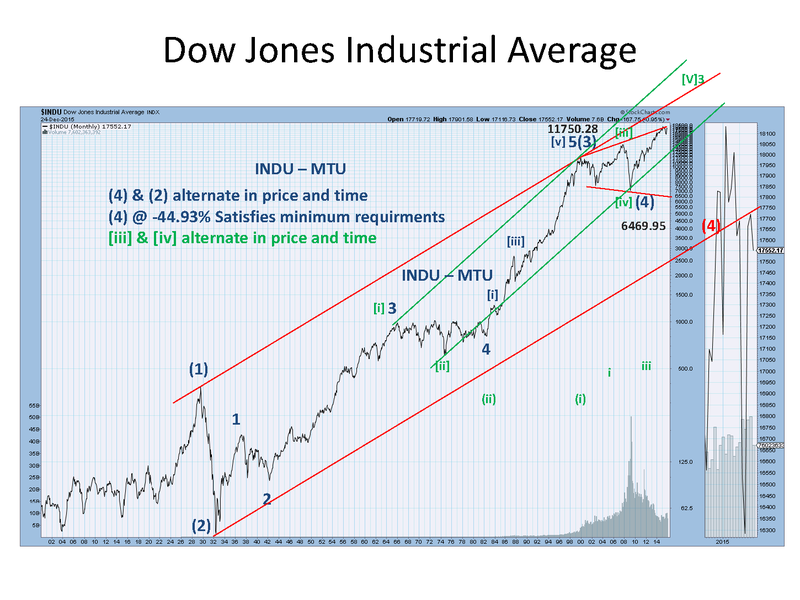 Likely of intermediate-degree (Y)-up or (5)-up (Chart 2). [2-semi bullish, similar likelihood to 1-bullish above] A wave 2-up or B-up rebound is in progress - the blue [a]-up as marked. Based on this interpretation, there's a chance that today's bounce is already [c]-up of B-up (or perhaps 2-up) based on ES squiggles (Chart to the right). See the 2nd chart below. Which low does one start counting? 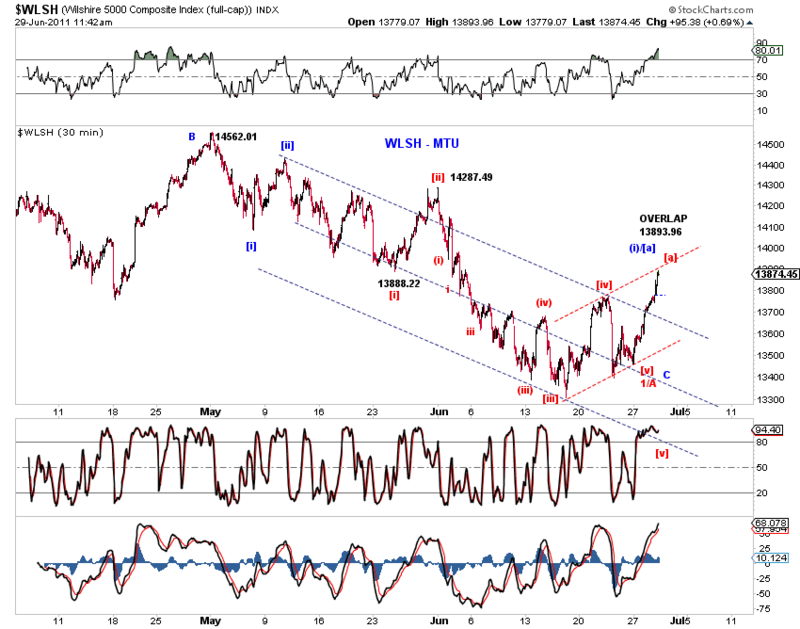 (2) makes adjustment to the bearish count. 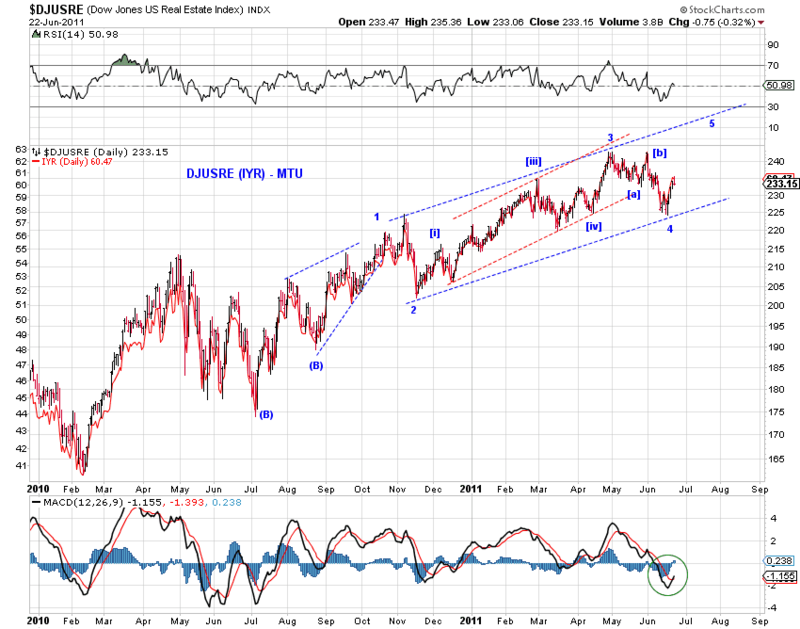 The Feb 2010 entry highlighted the most probable long term bullish or bearish wave counts for U.S. stocks (see this chart). 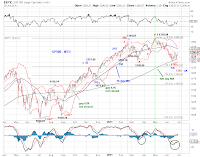 Based on the bullish count, primary wave -up of cycle wave V-up of supercycle wave (V) of grand supercycle wave [III] has been in progress since the 2009 low. 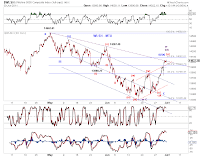 Based on the bearish count, grand supercycle wave [III] ended at the 2000 high and a grand supercycle wave [IV] correction is in progress. At that moment, it appears that primary wave -up of cycle wave c-down of supercycle wave (a) of grand supercycle wave [IV] has been in progress since the 2009 low. 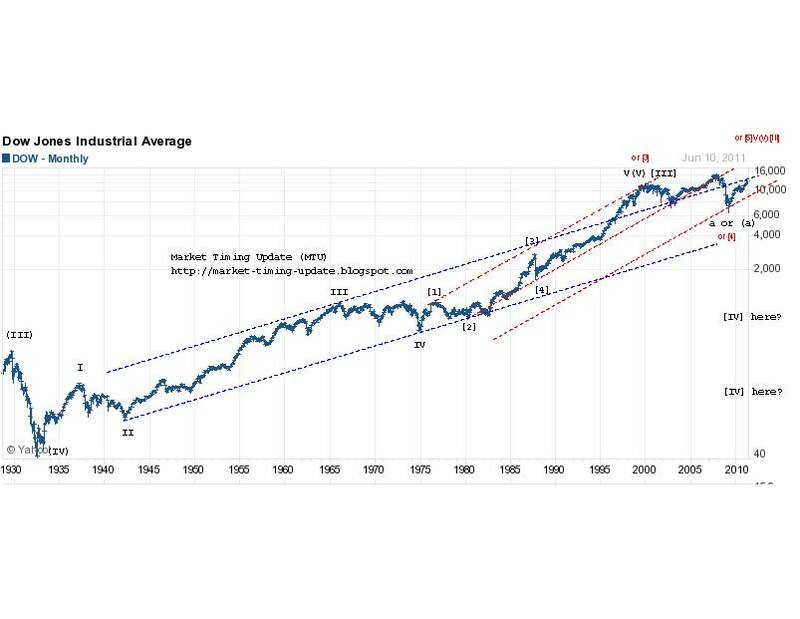 What has happened over the past 16 months? 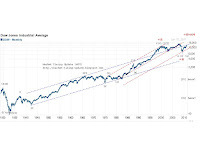 6 of the 11 broad market indexes have since exceeded their respective 2007 highs, including the equal-weighted SP500 index (Chart 1). Among major SP500 sectors, consumer staples, health care, consumer discretionary and retail sectors have also exceeded their respective 2007 highs, with energy, material and industrial sectors not far behind (see Were it not for financials … (1/21/11)). 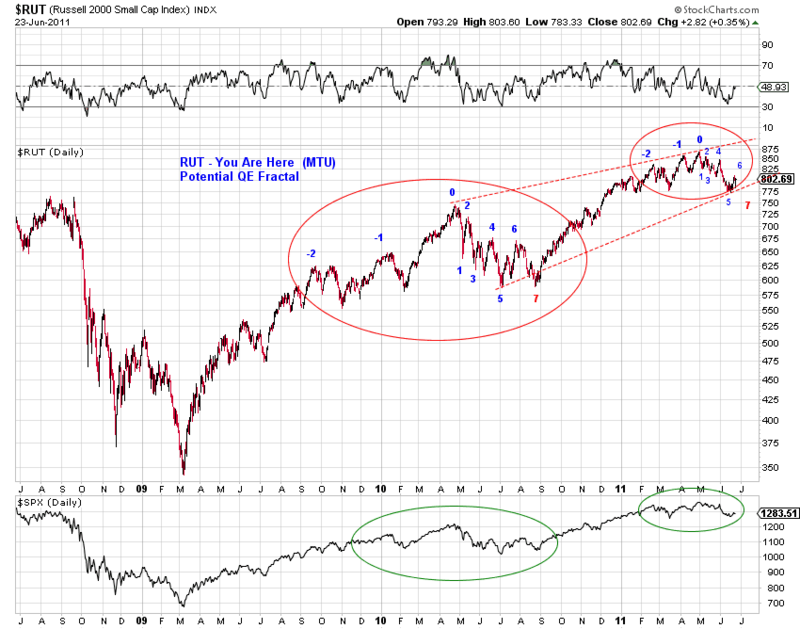 In Europe, $DAX and $FTSE100 have already retraced 87.92% and 80.31% of their respective 2007-2009 decline. 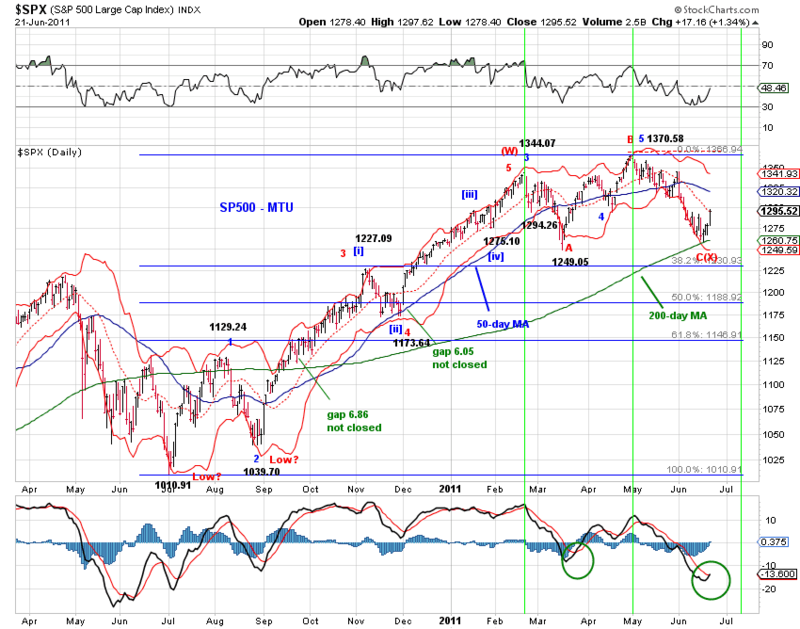 Chart 2 presents an addition to the top bullish count, inspired by tglacour’s comments to the Feb 2010 entry. While the primary count in Chart 2 differs from what I gather is tglacour’s count (see the alternative count), the main message is the same. 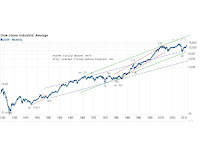 Based on this count, cycle wave V-up of supercycle wave (V) of grand supercycle wave [III] has been in progress since the 2009 low. As a result, the 2009 low is one wave degree higher relative to the previous top bullish count. (2) the 2009 low rests right on the boundary of the base channel. 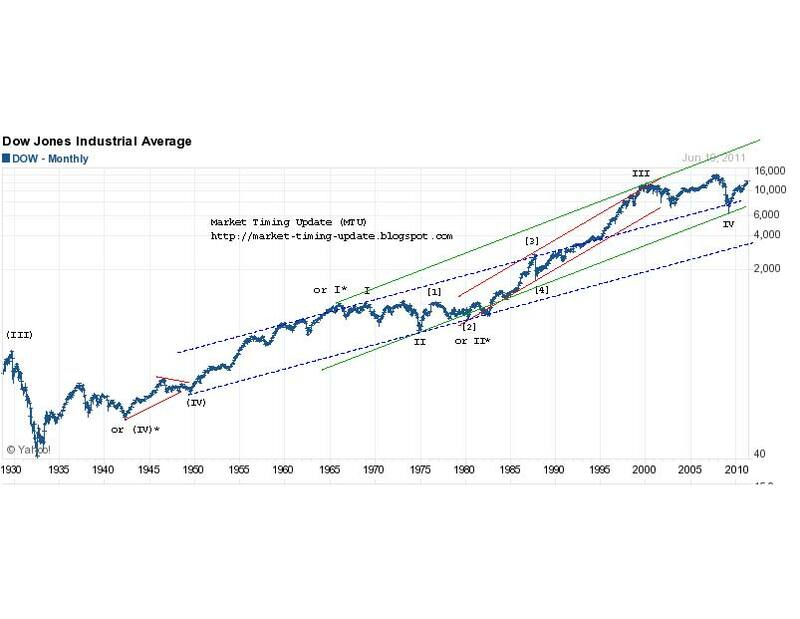 Given new market developments (i.e. 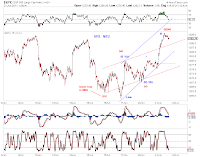 new all time highs and deep retrace highlighted in Chart 1), we must downgrade (but not eliminate) the likelihood of the rally since the 2009 low being primary wave -up of cycle wave c-down. 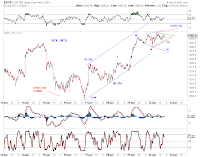 Instead, a cycle wave b-up (or x-up) or supercycle wave (b)-up (or (x)-up) appears far more likely within the bearish interpretation. 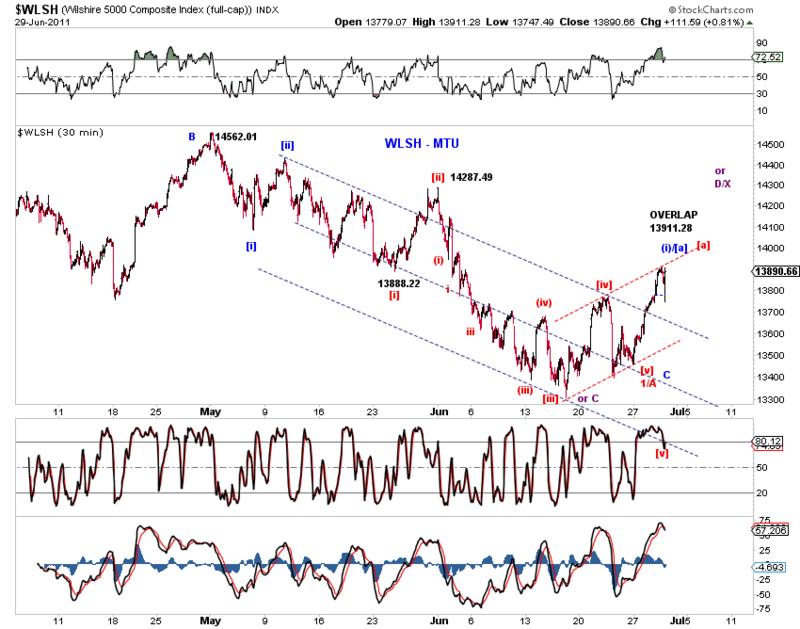 Please also see discussions in A Potential x Wave (2/4/11) Chart 3 presents the adjusted count. For the very near term, squiggle price actions are not as bearish as the magnitude of today's sell-off would imply. 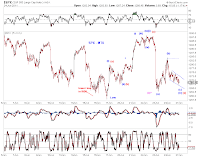 So far we have higher lows from the recent nominal low, but no higher highs. 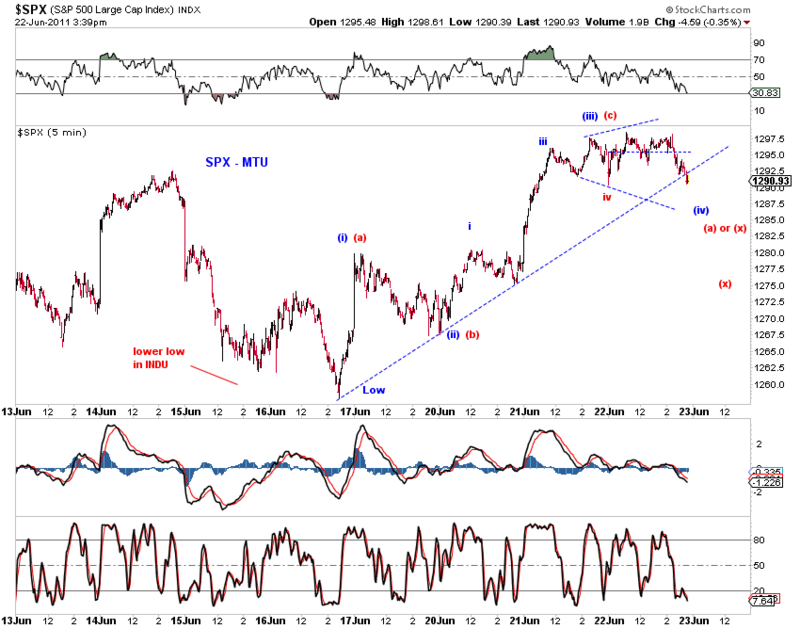 We may be looking at the end of a small degree second wave or [x]wave (flat-up)or [b] wave (triangle sideways) in the form of a zigzag (Chart 1, blue and red) although the super bearish count exists (Chart 1, purple). 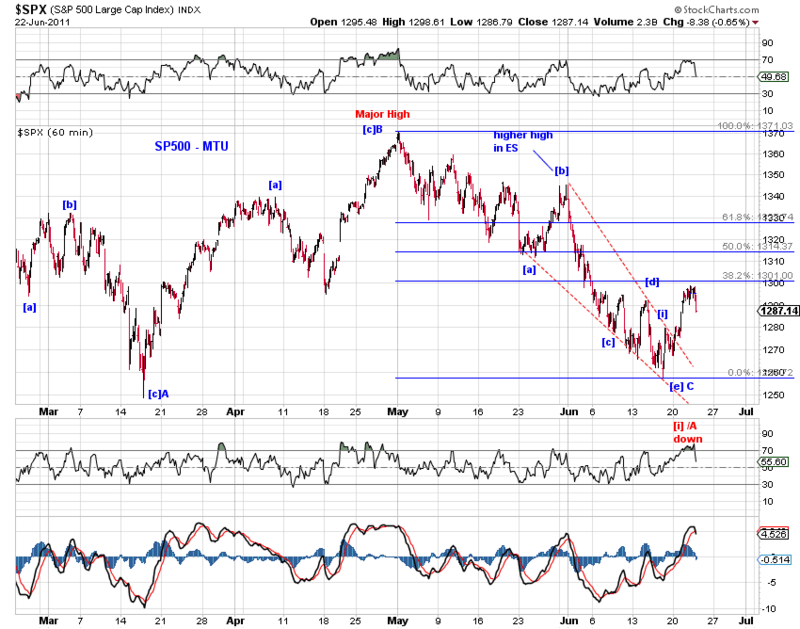 For the short term, whether a near term low was in or is still missing a small degree 5th wave down remain unresolved. 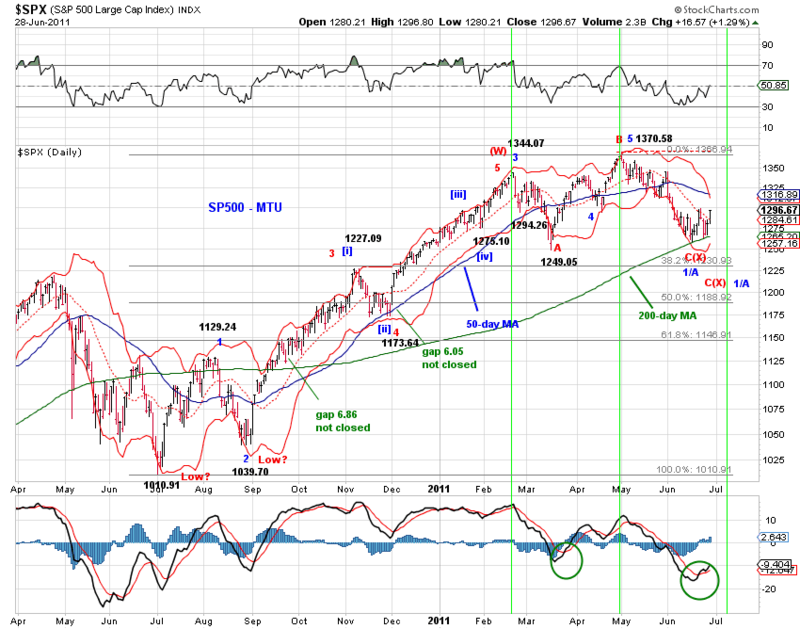 As the squeeze by MA50 and MA200 gets more intense, it should be resolved shortly (Chart 2). 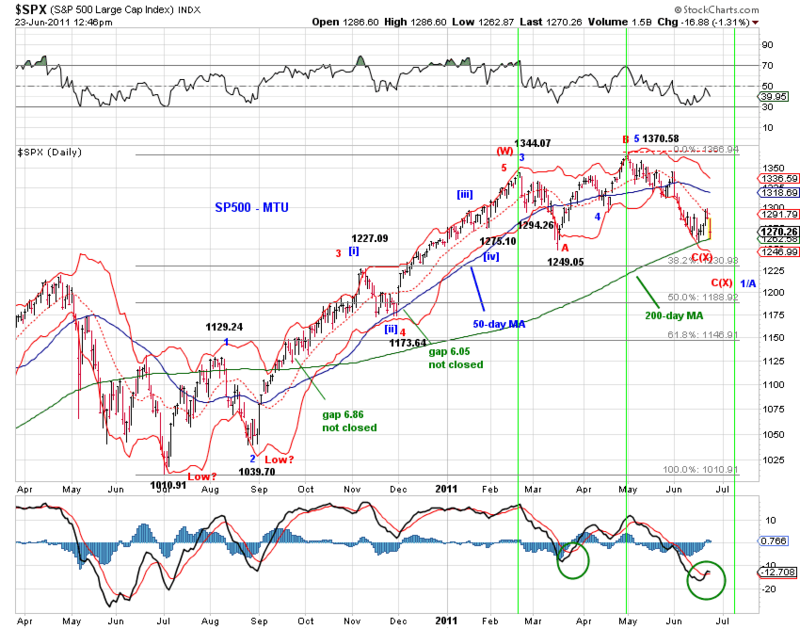 The 200-day MA held (Chart 1). 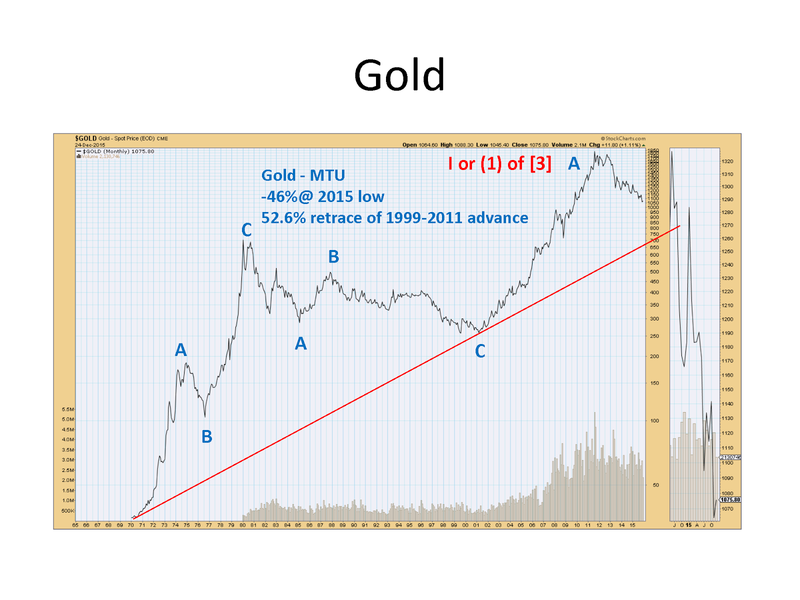 There are three competing scenarios. 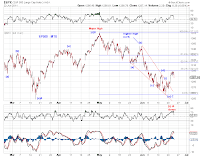 The June low is the bottom, either as the end of the correction since the Feb high or the end of the initial decline from a significant top at the May high (Chart 1). So the rebound is the start of a new bull cycle or a wave 2/B retrace. 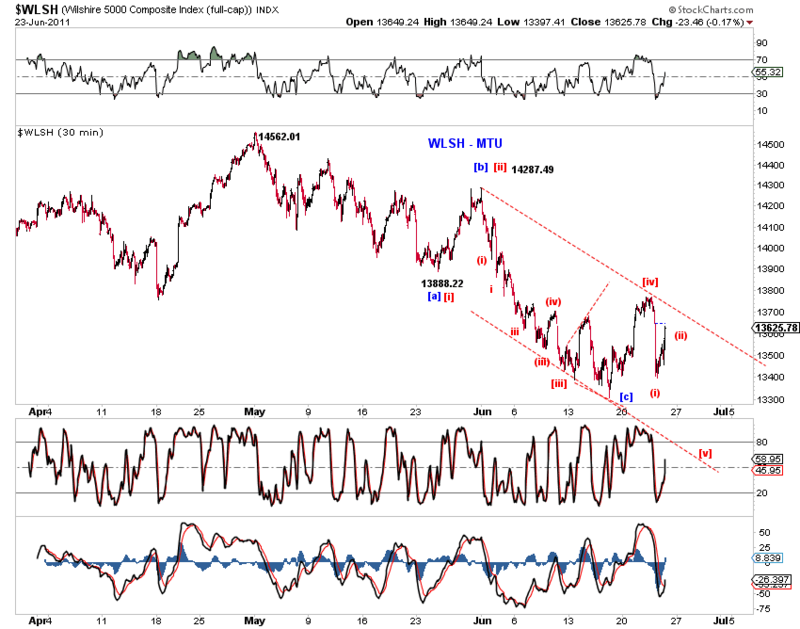 The rebound from today's low is wave (ii) of [v]-down (Chart 2). 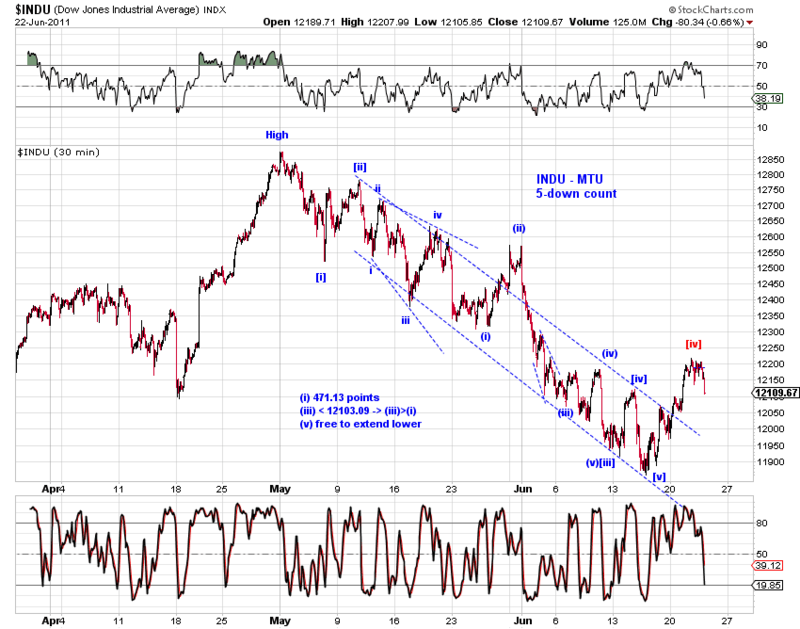 Since NDX has made a higher high, it's possible that today's high is (c)-up of [iv]-up. 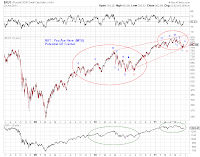 Finally, there's the QE fractal discussed in recent weeks. 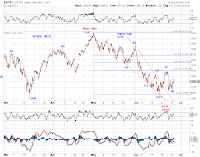 Chart 3 offers an update - the market appears to be in a wave 6 rebound as marked the chart. 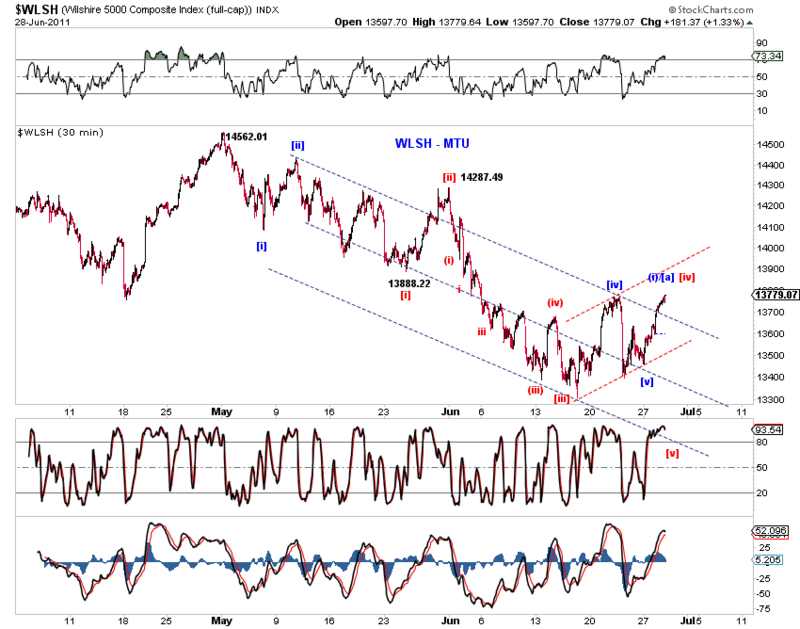 This time, wave 6 may or may not get as high as wave 4 during QE1/2. 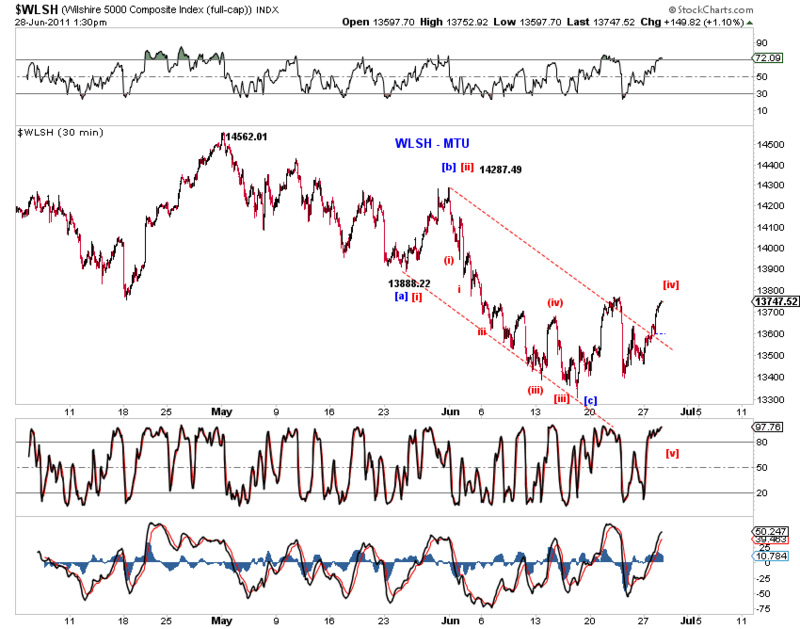 ES likely to test the wedge trend line, now a potential support. 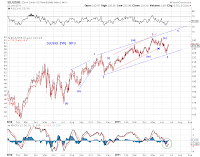 This count appears to channel well. 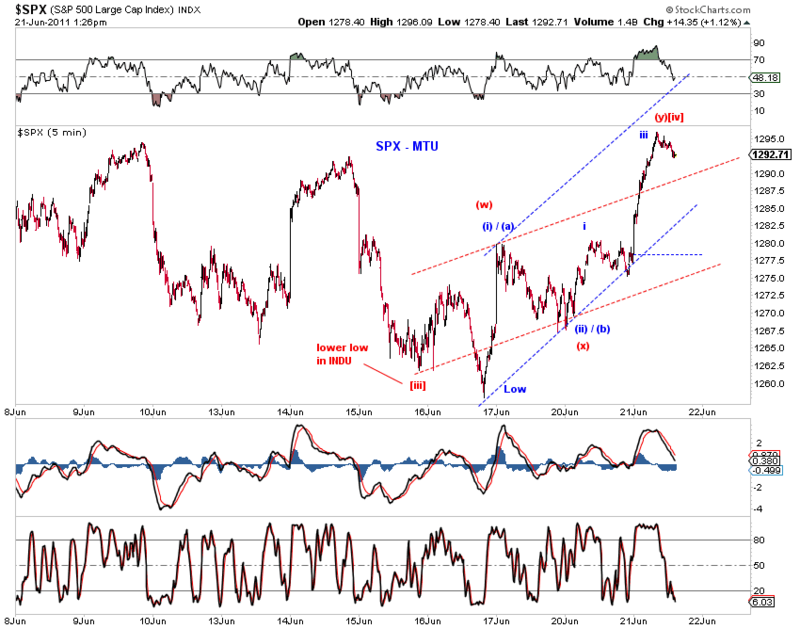 The first three charts updates the top tracking counts. 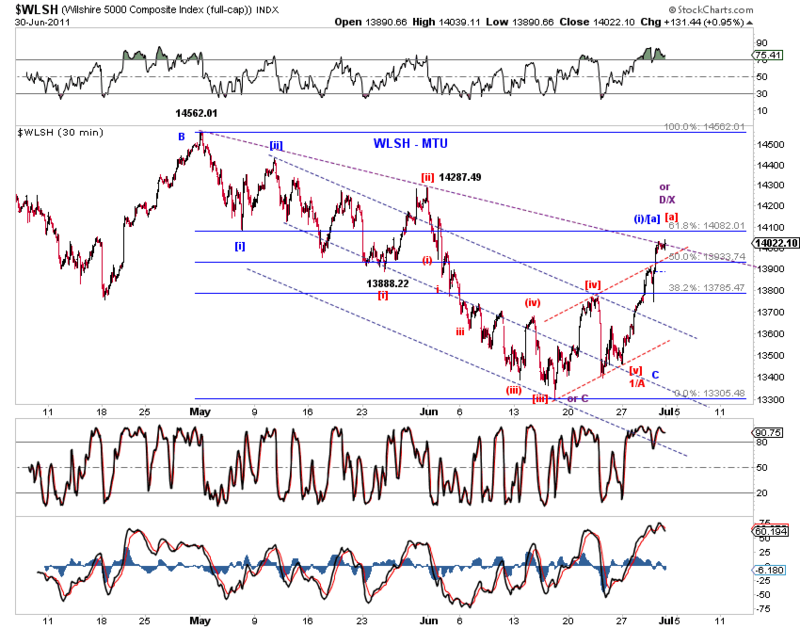 Note that the rebound so far has retraced about 0.382 fib (chart 1). Chart 4 updates the squiggle count on SPX discussed earlier. Multiple near term options before Ben's press conference, including two triangles and one ED. 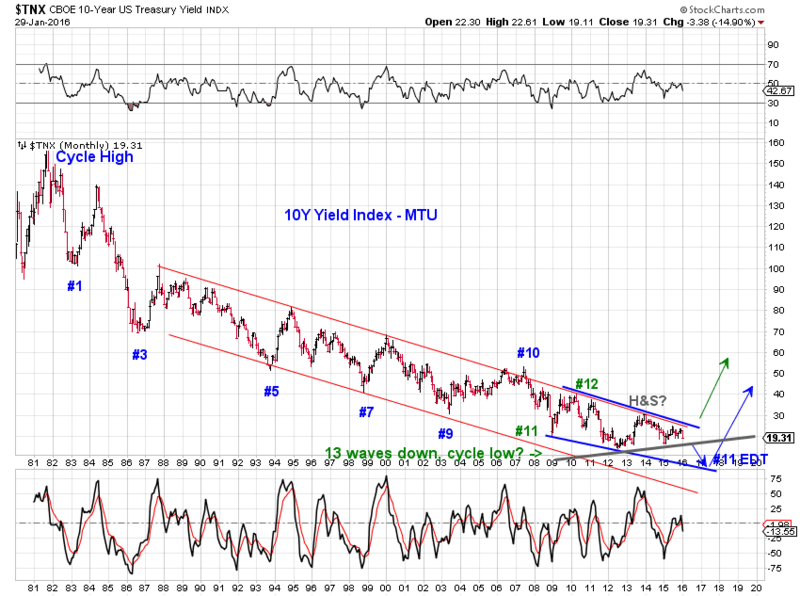 There's meaningful potential for a trend change (Chart 1). The broader market is not yet out of wave [iv] territory (Chart 2), but $RUT virtually overlapped and $MID is a close second. 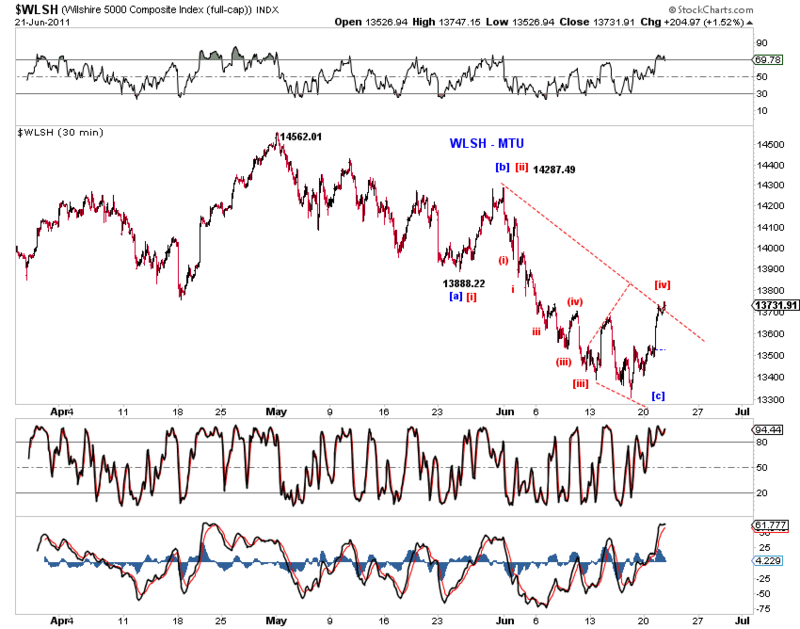 $MID and $RUT are very close to overlap with the bottom of the initial wedge. 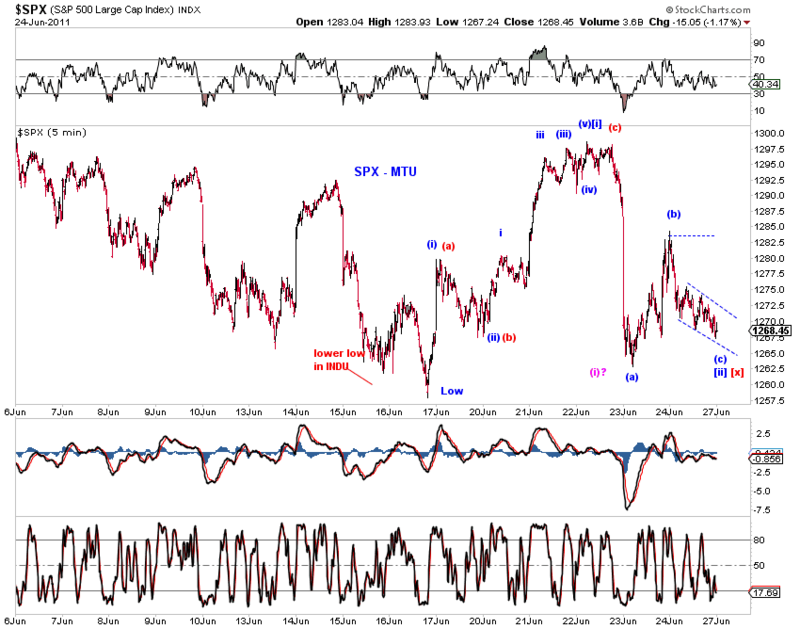 Here's a creative squiggle count on $SPX on the current advance. Wave [iv] or an upward breakout. 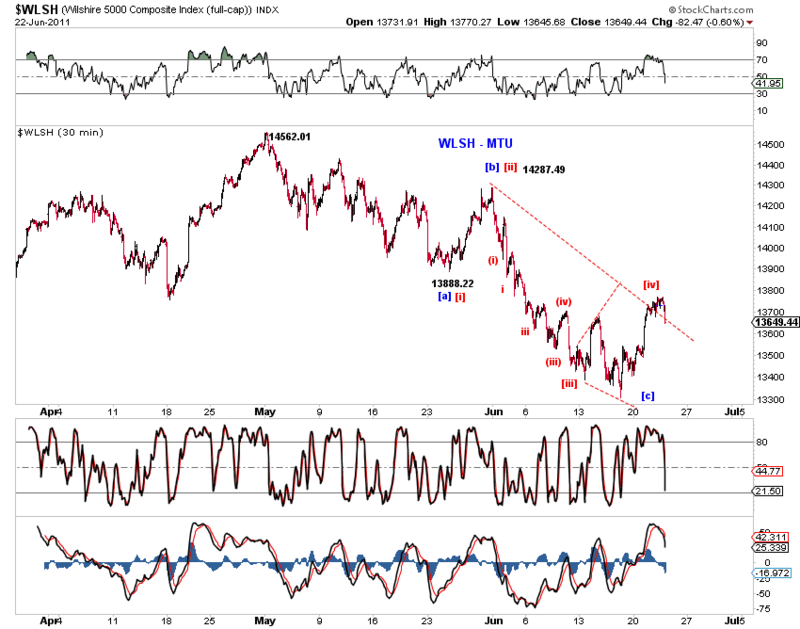 For the very near term, the market is likely approaching the end of a small degree five from yesterday's low.